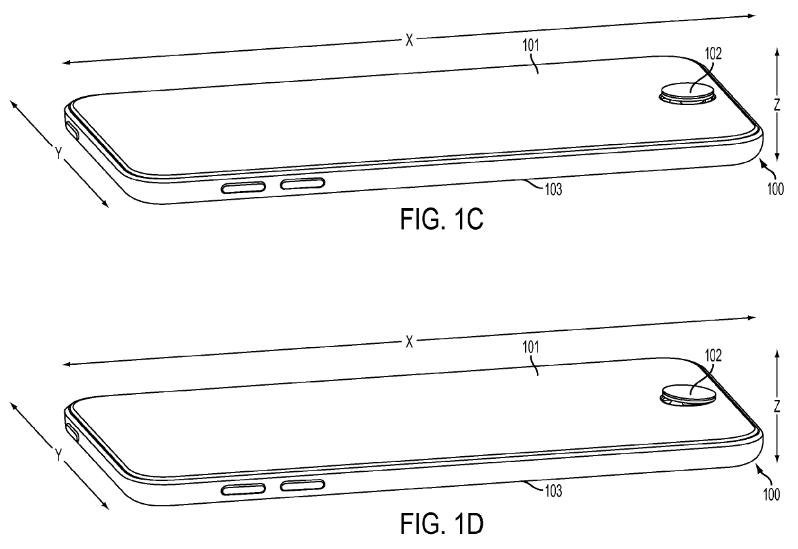 The U.S. Patent and Trademark Office today published an Apple patent application revealing the company's interest in an iPhone or iPad home button that transitions form its normal functionality into a small joystick for gaming (via Patently Apple). The "multi-function input device" would serve its normal home button functions, ostensibily with Touch ID and all other current features, but with a simple pressure click would pop up and transform into a slightly elevated thumb joystick. A simple push of the elevated home button back into a flush position with the body of the iPhone would return it to its original state when done gaming. Diagrams included in the application show a very low-profile joystick , allowing for some level of physical control while being much smaller than traditional game controller joysticks in order to fit into the thin bodies of iOS devices. Apple's claims within the patent application note some gamers' hesitancy to play seriously on a smartphone due to the entire set of controls resting on the screen, with their fingers blocking a significant portion of the game's content. The company thinks a built-in solution in form of this new home button could be an acceptable option for those unable or unwilling to carry additional gaming accessories. As noted by Patently Apple, the patent, with inventor credit going to Colin Ely and Fletcher Rothkopf, was originally filed by the company in the summer of 2013. Though it's highly unlikely this particular technology will show up on the company's next iPhone, presumably launching later this year, like most patents it's still interesting to see what possibilities Apple has considered in the past and the possible directions it may choose to go in the future. As if the home button doesn't wear out as is. With this it'll be worse... and will apple cover as they'll put it , over use of home button? That's very clever.. but as above I'd be wary of breaking / wear and tear / dirt and grit getting in under the button and jamming it (as happened with many existing iPhone home buttons). If they can make it durable, and seal it against anything getting in there, I'm all for it! In seven years of owning iPhones, I have never had a home button wear out. You'll get crumbs in there. And that's how you get ants. This would be like playing games with the nub mouse in the middle of my laptop. Pass. Imagine all of the pocket lint that would be trapped under that thing... no thanks... cool idea though.